Are you tired of that ugly venting hose of your portable air conditioner hanging out the window and pumping hot air? Discover the vent free solution that exists right here, right now as the evaporative cooler saves you a lot of money in running costs and is cheap to buy too! This section of the website is given over to answering the concerns and questions of many room AC unit users that are looking for an alternative way to stay cool. People like you that are looking for a portable cooler without the hot air venting hose and the high running cost of their current power hungry monster! The first thing I should cover here is the actual difference between the two kinds of cooling unit: the portable AC and the evaporative cooler. That's because there is a huge difference both in the way the two types work and what you can expect from them. Let's take a moment to compare the two by first looking at each type and how they work. Just like the fixed units you may have in the home, a portable AC works on the principle of heat exchange, using a refrigeration process similar to how your domestic fridge in your kitchen works. It takes the warm air drawn in the back of the unit, pumps it through the refrigeration section which sets up an exchange of hot air into cold air using CFC gases, then pumps out the chilled air via the front of the unit. The hot air that is produced by this exchange is pumped out via the vent hose which needs to be passed to the outdoors somehow, usually by hanging the hose out an open window or a dedicated ventilation opening through an external wall. It takes a lot of electricity to run this process, typically 1-2 kilowatts, which is why they are quite expensive to run. If you have one or more of these in your home, you probably dread your power bill dropping through your door at the end of the month! A Portable Air Conditioner Without Exhaust Hose Venting? You probably often read about the kind of portable or free standing air conditioning unit that doesn't need an exhaust hose trailing out the back of it. And maybe you believe this is a wonderfully convenient and attractive appliance. Unfortunately, the truth is that a true AC unit must vent the hot air it produces to the outside via an exhaust vent or hose. If it doesn't do this, it will not cool the room at all! 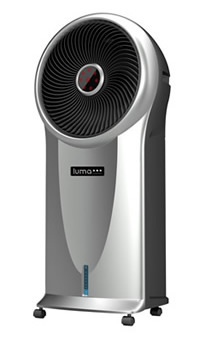 When you hear stories of this kind of cooling device, the writers or advertisers are actually describing an evaporative cooler, which naturally does not requite a vent because it does not produce any hot air! Writers somehow manage to confuse these with true air conditioners and that confusion is what is fooling a lot of people into thinking they can get something that is not what they thought it would be. If you ask any major retail store how many evaporative coolers get returned to them because a disgruntled customer thought it was an AC and the answer will stagger you. The most popular excuses for returns are, "The unit doesn't cool the room," or simply, "It doesn't work." This is not because of any flaw in the evaporative cooling unit's workings. It is simply the customer had been made to believe they were buying an AC by misdirecting advertising! Well I'm here to tell you the truth! You cannot buy an unvented portable air conditioner without an exhaust hose because it doesn't exist! On the other hand, you CAN buy a swamp cooler with no exhaust vent because it doesn't need one and it most certainly DOES exist! 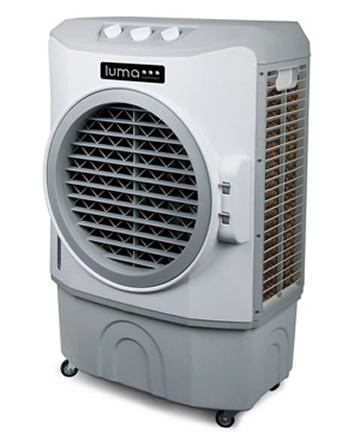 Unlike AC, this type of cooler has no heat exchange mechanism inside, just a fan, a water reservoir and a moist membrane through which the warm air of the room is passed (by the fan). The moisture is evaporated as air passes through the membrane, causing the air to chill and that cold air is forced out the front of the unit (by the same fan. The water reservoir is filled with regular tap water and you can add ice cubes to increase the chilling effect if you want. Different models have varying sizes of reserve tank, but generally they are large enough to allow the unit to run continuously for several hours before needing a refill. There are no other mechanisms inside there and since there is no heat exchange going on, there is no hot air produced. This means there is no need for a vent hose and running costs are kept low because the only thing that uses electricity is the fan. Power consumption is therefore typically 50-100 watts, which is no more than a standard light bulb. This is why their owners love them so much, especially when they get their power bill at the end of the month! Best Swamp Coolers to Buy? 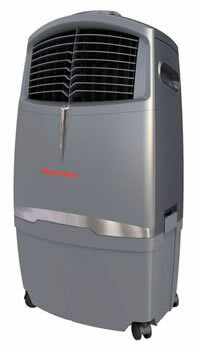 There are several very good models that are on sale right now that will do an excellent job of keeping you cool indoors or even outdoors on your porch or patio is you need it. Below I have taken my personal favorite models and compared them to give you a good starting point for your own search into the best ventless air cooler for your needs. The advantages of this type of cooling device over a conventional portable air conditioner are very pronounced in low cost and portability. They are a fraction of the cost to run an AC while also being cheaper to buy, while the obvious lack of an AC venting hose or duct makes them totally portable and not restricted to being placed near a window or ventilation port. 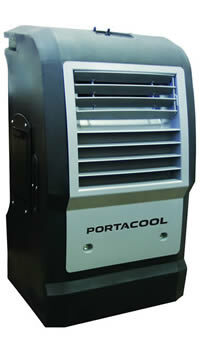 For many, it is the low running cost that sells them on these machines in preference to conventional aircon units. With power consumption typically less than 10% of a comparable AC, it's a no-brainer when it comes to the household budget! As far as portability is concerned, most room AC owners dislike the vent hose and how it restricts the places they can put the unit. They must be vented to the outside because hot air is pumping out that hose and if you let it trail into the same room you're trying to cool, you'll actually end up with a net increase in temperature! This makes evaps such a great choice for people who like the freedom to put their cooler wherever they want or need them. They can even be used outdoors to provide a cold blast of coolness in hot spots on your porch, patio or terrace and you don't have to feel guilty about wasting electricity because they use so little! Not only that, but since there is no heavy refrigeration motor and compressor as found in AC units, swampies are much lighter and easier to wheel around. Some models come with hosepipe attachments so you can hook them up outdoors to a continuous supply of water for all-day running. Unfortunately, there is one major disadvantage that prevents people in many areas enjoying the cost savings and greater portability of these units. It's their lack of effectiveness when used in a humid atmosphere. Simply put, if the air in your area has high humidity (50-60% or greater), the cooling ability of swamp coolers is greatly reduced. The higher the humidity, the worse they perform. At 100% humidity, there is zero cooling effect! This means it's all down to location as to whether you can enjoy their great benefits. If you live in a hot, dry place like here in Colorado, these units will cool the rooms in your home as effectively as the more expensive AC. But if you live by the ocean, a lake or other large expanse of water or anywhere there is a very hot, humid climate, they won't work very well or not at all! But since you're asking, I will assume your climate is dry enough for this kind of cooler to work well. Another point about the nature of the way these coolers work is their humidifying effect. When you live in a very dry, arid climate breathing in dry air all the time can bring respiratory problems of its own. By increasing the humidity in a room whilst providing a welcome blast of chilly breeze, these machines bring a major benefit in moister air to breathe. This helps people with respiratory problems that have adverse reactions to breathing very dry air. You might want to consult your doctor about that, because there are medical benefits that I'm not really qualified to go into detail about. I just know from personal experience that I breathe better in moist air than in very dry air. So that's the ups and downs covered in brief with more details provided in separate articles. Let's take a look at some of the best swamp coolers that are on sale online or in stores right now.